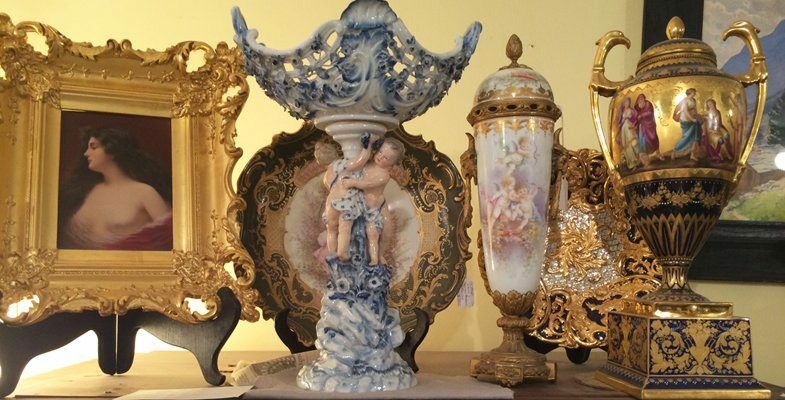 especially Antique Porcelain, Crystal Stemware, Glass, Furniture and Decorative Accessories. We have been a favorite antique store for twenty six years. Whenever our customers come from all over the world , they make sure they stop at Elegant Findings Antiques Store to see our rare one of a kind antiques. Let Elegant Findings Antiques store be your one stop shopping place to decorate your home. Don't miss this EXCITING SHOPPING EXPERIENCE! MAKE YOUR HOME YOUR CASTLE WITH elegantfindingsantiques.com. 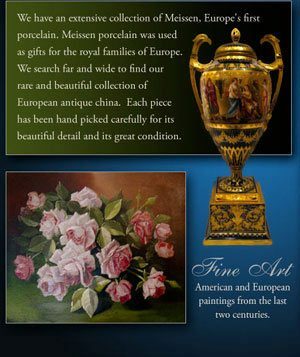 Collection of beautiful antique porcelain, including Meissen figural centerpiece and Sevres urns and chargers. Set of 12 Museum Quality Cauldon rose plates signed Harrison, each painted with a different beautiful bouquet of roses.